Water is that mysterious substance that is responsibly the main difference between a plant that can sustain life and one that cannot. Its unusual characteristics make it an enigma as it can be in all three states at the same time and in the same space that is a gas, a liquid and a solid. Also a noted difference from any other substance on Earth is that when it is a solid it is less dense than when it is a liquid, i.e. ice floats. In reality, there are many different “types” of water and different characteristics. Some of those characteristics have become more common place, like the alkalinity of water (PH) and the surface tension of water. The surface tension is the degree in which water is attracted to itself and the lower a surface tension of the water the greater the ability of the water to break substances down. So, for example, to make potatoes soft, they are placed into boiling water – the boiling process lowers the surface tension of the water and therefore the potatoes begin to break down more rapidly. Where is you Next Glass of Water Coming from Today? Since we understand the complete reliance of the body on water to effectively and efficiently work, we have concentrated on providing to ourselves and others a proper source of water. While distilled water and Reverse Osmosis (RO) waters have their place, they also have their disadvantages. Both distilled water and RO are great technologies. However the water that is produced via these technologies are void of minerals and are considered dead. To enliven these waters minerals must be added back in or when they are drunk these waters extract minerals from the body. Water has memory and it remembers to what it was connected to in nature. When it enters the body and sees those minerals present there it pulls them out of the system to satisfy the needs of the water itself first. It is only after the water has been satisfied that the individual drinking this water can provide themselves with the necessary mineral intake without having the water extract the minerals from that individual. 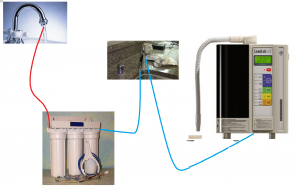 With this in mind we have developed a complete Home system for drinking water based on a Water Ionizer from Enagic (click here for more info) and a filter system (click here for more info) that provides what we consider to be the basic necessity for clean and energized drinking water. 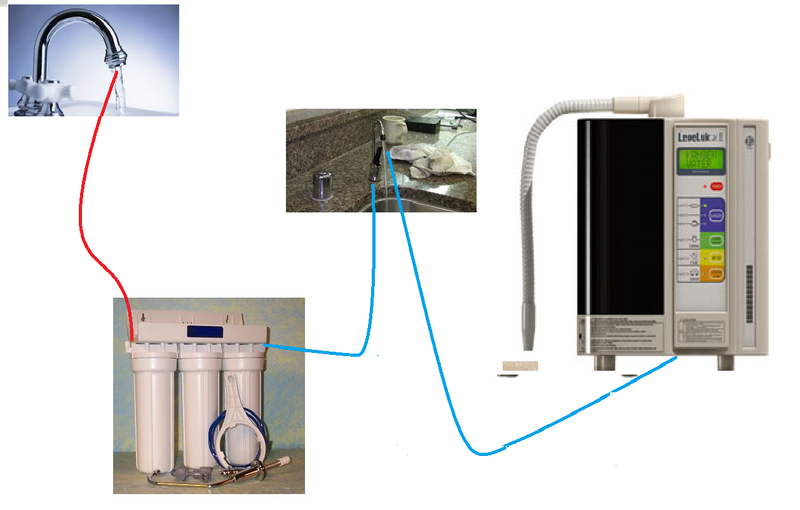 Below is an illustration of that system that we use and which provides access to very clean and energized water on a moment by moment basis.